What We Can Learn about Motivation from Monkeys — Maestro Quality Inc. In the previous blog, The Motivational Trifecta, I introduced the first two psychological needs: autonomy and relatedness – each requiring a delicate balance. The third psychological need people want satisfied is a feeling of competence. As human beings, we are motivated to master tasks and learn new things. Mastery and learning top the chart when I coach executives to uncover their sources of satisfaction at work and then to develop interests outside of work that provide the same level of satisfaction. “Competence is our need to feel effective at meeting everyday challenges and opportunities. It is demonstrating skill over time. It is feeling a sense of growth and flourishing.” ~ Susan Fowler. Monkeys Enjoy Solving Puzzles – Why? The monkeys’ survival didn’t depend on solving the puzzles. They didn’t receive any rewards, nor avoid any punishments, for their work. I would also suggest that they had a safe supportive environment in which to grapple and grow, a key to peak performance. 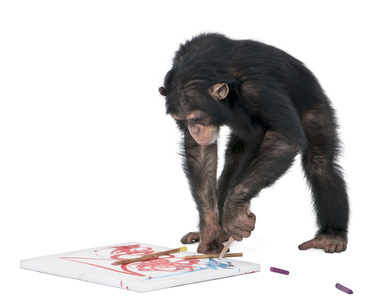 Harlow offered a novel theory: “The performance of the task provided intrinsic reward.” That is, the monkeys performed because they found solving the puzzles gratifying. They enjoyed it. Joy served as its own reward. Further experiments found that offering external rewards to solve these puzzles didn’t improve performance. In fact, rewards disrupted task completion. Based on my own personal experience, I’m not surprised. When focusing on a penmanship award in grade 4 and 5, I was not only distracted by the reward, but also by the stress and fear of losing my “best-penmanship” status. The first drive is survival. We drink, eat, and copulate to ensure our survival. The second drive is to seek rewards and avoid punishment (carrot-and-stick). The third drive is intrinsic: to achieve internal satisfaction (self-direction). Did I gain internal satisfaction from improving my penmanship? Yes! Being left-handed, I was motivated by the challenge and satisfied with the outcome. But, was there a cost? Were my overall personal development and performance behaviours affected by conditioning to seek external rewards and the fear associated with loss of status and punishment of peer humiliation? Most definitely! Like many, I have experienced performance anxiety that has been crippling at times, demotivating, and threatening to my self-regard. Trying to motivate people with the promise of rewards or fear of loss or punishment (expressed or implied) simply doesn’t work. What are your challenges with motivation? What current incentive and reward practices need to be evaluated? What are the costs of your current incentive and reward practices – financial and human performance? You can contact me at patricia@maestroquality.com, at 905-858-7566, on LinkedIn, on Maestro’s Facebook page, or follow me on Twitter.